And the countdown is on! Just a few more days before we celebrate everything cultural here in High River and across Canada! Join me this year in celebrating High River's Culture Day celebrations! There are 15 venues featuring everything from artists in galleries and studios to concerts, dances, quilt shows and more, all being showcased over three days! This year I will be at my gallery from Friday through to Sunday. 12:00 to 4:00 pm - Art and Soul Gallery (124 - 6 Ave. SW, High River) New works, Art Demo. 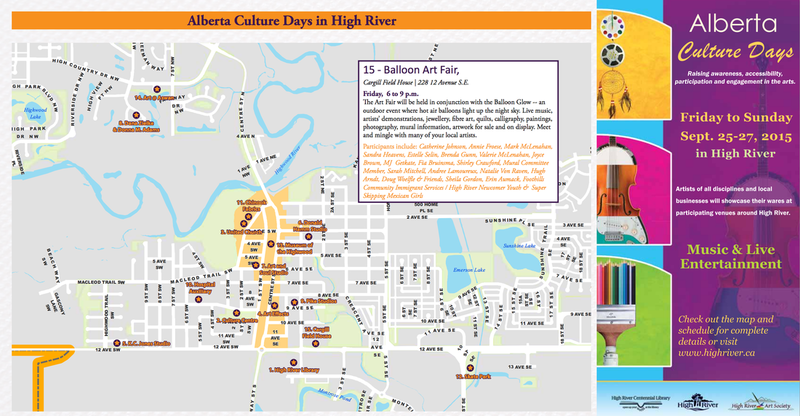 6:00 to 9:00 pm - Annie will have work at the Balloon Art Fair (See Culture Map - Site 15) hosted inside at the Cargill Field House at High River's Recreation Centre. The balloons will be taking off at 5:00 pm, and then later, after sunset, tethered next to the Rec. Centre for "GLOW". It's not something you want to miss! It's absolutely magical! 12:00 to 4:00 pm - Art and Soul Gallery - Concert Series, Art Demo, Activity Table for YOU to create at. 11:00 am to 4:00 pm - Art and Soul Gallery. Concert featuring Wayne Corner and Friends (blues music) starting around noon. 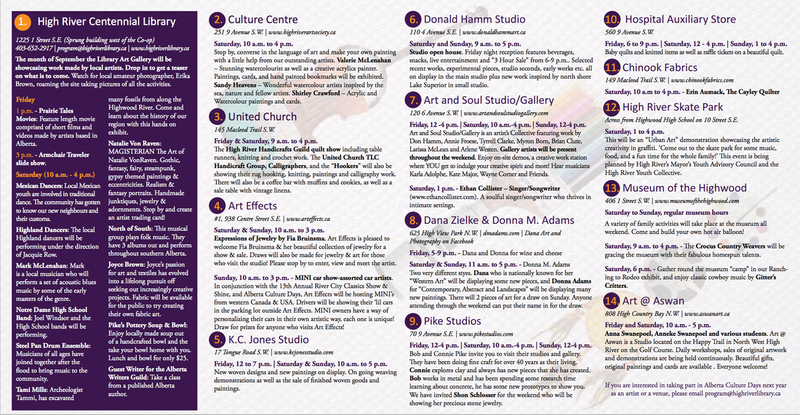 HERE ARE THE CULTURE DAYS INFORMATION PAGES: MAP AND DETAILED SITE INFORMATION. ART AND SOUL GALLERY IS SITE #7 THIS YEAR. Help us celebrate the things we are passionate about. Invite your friends and family to celebrate with us.